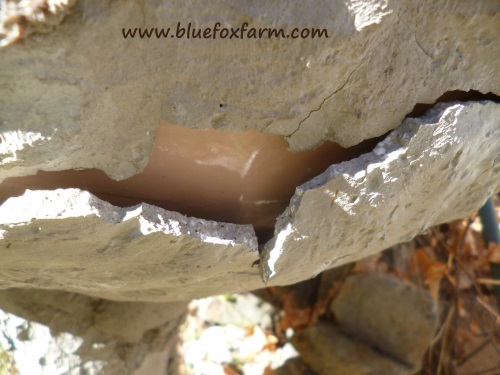 It's not all smooth sailing when you're making hypertufa - I make it sound as though it's easy, when in reality I've made many blunders, had some great ideas that turned out to be duds, used the wrong mix, tried to move the piece too soon...you get the picture. As with anything that has no rules and you're making them up as you go along, a great idea could come to naught quicker than you can shake a stick. 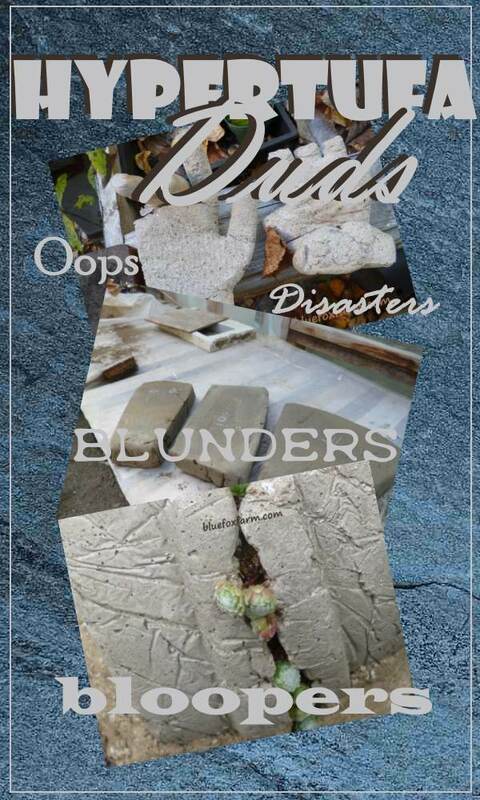 Here are a few things I made, tried to salvage, and they still didn't turn out. Oh well - I can always bury them, or turn them into mulch for the Clematis (which love the pH of deteriorating concrete - who knew?) or just break them into bits and mix them in to a new batch. My first attempt at a large flat bowl was a disaster. Not only was it much too thin, to compound the error, I tried to turn it out of the mold much too soon. This doesn't work. Wait for it to cure and harden, which can take at least a week, sometimes longer for thicker pieces. Result; it broke into three big pieces. What should I do now? Sticking them back together in the same shape would have been too easy, so instead, I made a blob of mix for the base, then stuck them in to make a mountain. The mix didn't stick to the porcelain barbers sink that I rescued from the recycle center. 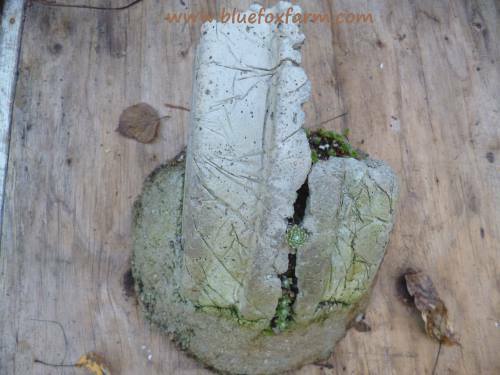 Over time the hypertufa has started to fall off. Of course, I could always go and add more to the bare spots, but essentially, the porcelain is too shiny and smooth. It really needs to be roughed up. 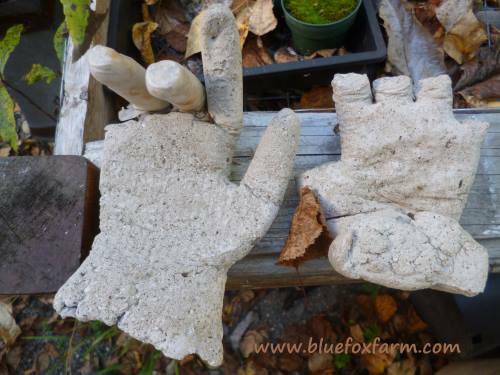 The fingers on hypertufa hands are always fragile - here are two that didn't make it. 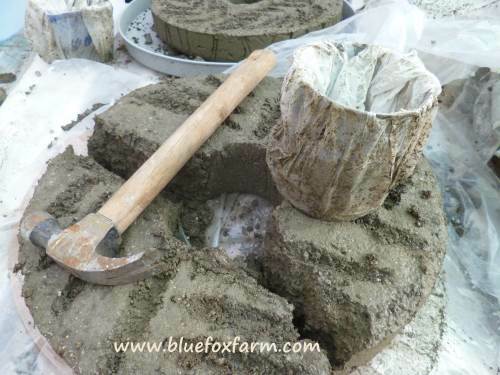 This made me very sad; one of the latest three hypertufa millstones just wouldn't come loose of its mold, so instead of waiting until it was a bit stronger, oh no, I had to try and get the center mold out with a hammer. Honestly; you would think I'd learn. 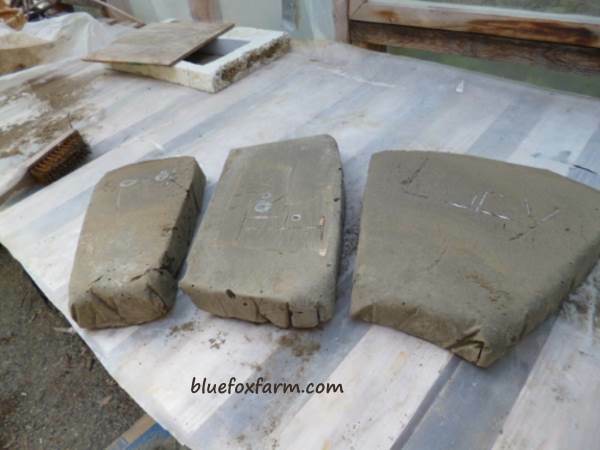 The pet grave markers look okay at first glance, but the middle one is supposed to say 'Tiggy' but it's backwards. There is something so confusing about working mirror fashion that I second guessed myself, and it turned out all wrong. 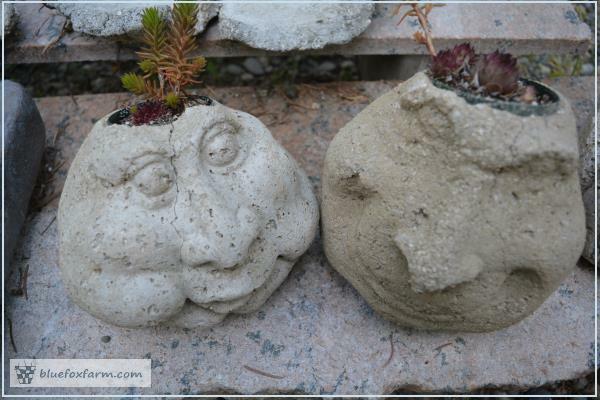 These faces were made from latex molds, and we built them with a pot in them so they could be planted with some tiny succulents. 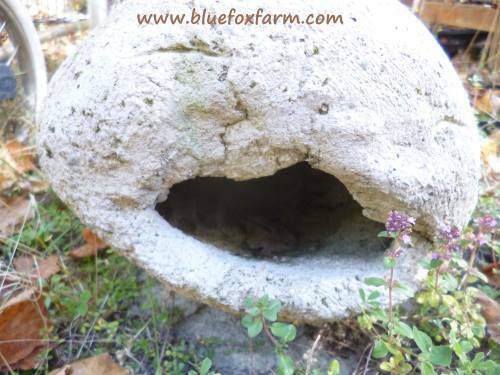 Over the winter, due to not having any drain holes, the faces cracked under the pressure. My takeaway on this is to never give up. There may be some failures, as is the case with any craft, but learning from your mistakes can lead you to spectacular successes. Some people hide their duds and hope that no-one notices; I keep them in the garden so I can be reminded and possibly get a brainstorm of a way to improve on it, or reuse the project some other way. After all, wasn't Thomas Edison the one who found 1000 ways NOT to make a lightbulb? 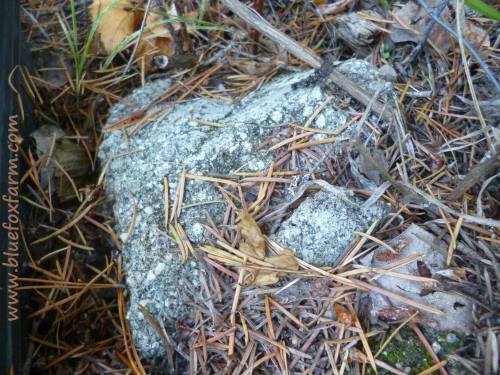 Wanting more of this kind of information about Hypertufa? Buy the Manual!